Divination is an important practice in African spiritual traditions. Practitioners are encouraged to develop their sixth sense in order to divine for themselves and others. Teacher Chief Yuya shares tools for sharpening one's psychic abilities. Divination is not cut and dry. Nor does it come easily. To be a good diviner one must be vibrating at the proper frequency. Your energetic vibration determines what you attract. If your vibrations are that of fear, you will inevitably draw in fearful circumstances and in the case of readings, imagery. Prior to doing readings, it is imperative that we check our vibrations and establish balance. Anytime we vibrate at a certain frequency and attract like energy we tap into the power of Orisha Osun. Osun is the force of congregation which brings people together. This is not always beneficial, hence the high divorce rate in the U.S. We attract what we are, actively and subconsciously. Energy you carry into rituals will be amplified. Internal issues must be resolved or they will shroud and cover rituals. We cannot have such attachments while doing spiritual work or sharpening our psychic abilities. Orisha Oya, spirit of the wind, bringer of change, transformation and evolution is the perfect energy to invoke for confronting issues. Oya deals with fear. While her mate Orisha Sango provides the courage to work through the fear that her winds conjure up. Reality is created based on the frequency we are vibrating at. 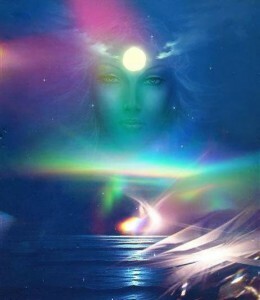 The Ori (higher self) lives in the realm of Okan and is your personal Guru. At any given time Ori is tuning into various channels yet, it is your personality that determines which frequency you will choose to focus on. You may tune into frequencies of love or war. Whichever channel/frequency you choose becomes your reality and is fueled by the power of Ori. We are our own broadcast stations attracting like thought forms. In closing, Chief Yuya reminds us that the mind is a laser and we must be careful what we aim it at. The key to enhancing psychic abilities is clearing emotional turbulence. Try these rituals to raise psychic ability and to clear vibrations. Bath: Prepare a bath with 21 uncracked eggs and sugar. Take the eggs and run them over yourself while thinking of blockages that need to be removed. Afterward, leave the eggs at the base of a tree or crossroads. Breathing Exercise: Breath in, filling lungs to capacity to the count of 4. Exhale to the count of 11. Complete this cycle 10 times a day for the first 7 days. Days 8-14, complete the cycle 20 times a day. This will help you gain control of your breath.